Enter your name and email address below now for instant access to the free report. 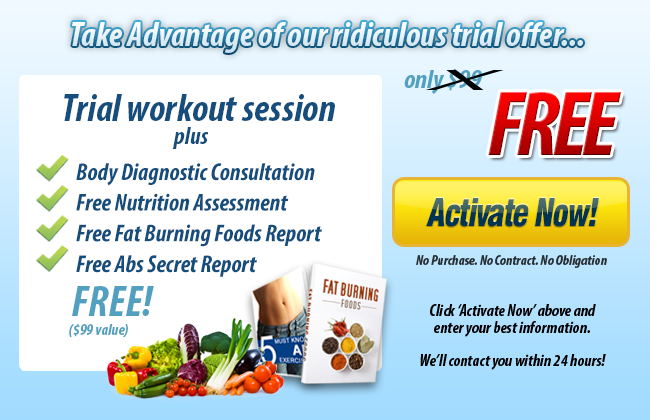 Have you Been Craving Quick, Legitimate & Long-Lasting Fitness & Weight Loss Results? Look and Feel at Your Best, and Finally Reach Your Total Body Health, Fitness & Wellness Goals with the Best Personal Training in Bronx, NY! Are you confused about what you’re really supposed to be doing with your exercise and nutrition plan? Are you fed up with wasting your time, money and energy on programs which don’t work? Are you looking for a program which helps you look and feel better while improving your health, and even reducing nagging injuries and pain? My name is Angel Perez, and I’m the owner of High Definition Training, your best resource for group and personal training in Bronx, New York. After spending years in the fitness industry, I came to a shocking conclusion — that the standards for successful training programs are ridiculously poor! By and large, from gym to gym, they’re terrible! That’s the ugly truth of why so few people are able to see or maintain real fitness and weight loss results. The big box gyms only care about their sales and profits, and the self-proclaimed “gurus” out there offer no legitimate experience or qualification. Meanwhile, you’re inundated with misinformation and bogus fads which don’t work. High Definition Training is out to change all of that, and deliver you the effective, customized approach you’ve been seeking. We personalize a comprehensive fitness blueprint for each of our clients, combining cutting-edge exercise, nutritional planning, and so much more to help you finally achieve your goals. We even provide our members with thorough body and movement screenings, to help us learn the “why” behind the lack of results you’ve seen in the past, or the chronic pain and injuries which have always bothered you. With friendly, experienced and knowledgeable trainers, a motivating environment, and a tailor-made approach designed just for you and your goals, you will look, feel and move at your best. Get more energy to play with the kids and grandkids, prevent major health problems before they arise, and get into the best shape of your life. 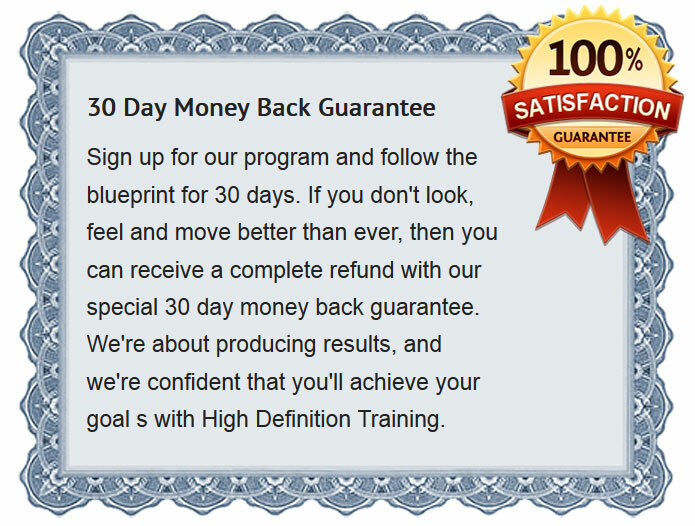 At High Definition Training, you always come first, and we guarantee you’ll see real results. I found out about HDT through a random flyer upon entering my local grocery store… I took a chance and called the number, that’s the day my fitness life changed. I met Angel and found him to be very professional, with great energy. If you’re looking for a juice head trying to preach about starvation and pill regimes…Angel is not your man. He assessed my current physical condition prior to any workout and then spent time finding out about me and my goals. I’d recently had a completely severed ACL, I was super nervous about exercise and being re injured. I also have severe asthma. Angel quickly assured me he would curtail my workout to suit me. We began our journey, quickly my mental attitude was in a place of doubt and discomfort…It showed all over my face, the other women during the training session, all of different ages and backgrounds quickly assured me that I would be ok and it will get better “the discomfort of getting back into working out” Angel says don’t worry about how fast or how many times you can do a particular exercise,just concentrate on form to get better. I thought to myself, wow I’ve never heard that before, in the past with other trainers I’ve been pushed to do more even if I just couldn’t. I knew then I had found something special. Time went on and my goal was not to have any “fat” wedding pictures…I refused, 9 months till the day I kept going, each session feeling more agile and full of energy, I looked forward to seeing the girls and being part of a team of people who had similar goals in mind. Each week Angel would bring new training tools very unconventional to what you see in gyms, but we all tried his methods and surprisingly they were so cool and held to his key principle, keep your form and focus on movement and becoming better. I was not only given great tools to keep my workout exciting but also given knowledge on food intake and great books to read. I tried a gluten free diet, and yes being Latin and a bread lover this was extremely challenging. The first two weeks were hard but with Angel’s support and my team, I not only got through the withdrawal of gluten, they all got to see my body transform rapidly. I would always carry my asthma pump, and stop and pump, almost five times per session. While slimming down and eliminating gluten I stopped all use of my asthma pump. There’s no pill my friends…it was a lot of hard work and dedication to myself and training. Months closer to my wedding date, Angel started to train me apart from the team so I could reach my goals. I was challenged like never before. I became stronger, leaner, and at one point a random man in the gym watched in sheer amazement of what Angel was challenging me to do and said ” bro you’re going to kill her” while he chuckled and looked over and said “nah she’s a beast, she’ll be fine” in conclusion I didn’t hit my goal weight..Better yet I fit nicely into my wedding attire…I even had to alter my clothing. Angel won’t focus on just your weight. He’s more concerned with proper form and movements, feeling and moving better. He is also concern with your attitude, and overall well-being. The weight will come off! He doesn’t scream or stand over you taunting you while you struggle, he is very focused on what you can do, and not what you think you can’t. He’s a man who has an extreme passion for fitness and movement. I’m only human and at times have lost my will to keep pushing, and Angel unlike any other trainer won’t give up, he will send text asking how you are doing. He never pushes; he just quietly lets you know when you’re ready. He is there to support you. Life happens, folks but if you’re really interested in change only you can do it, Angel and his company HDT will be the ultimate tool and support for your journey. Training at High Definition Training has changed my life and my way of thinking forever. It’s a special gift to be around Angel who lives for what he does and lives his mission statement. 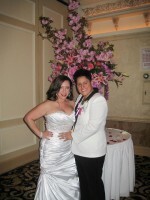 I became very impressed on how Angel educated others on lifestyle changes and methods to lose weight and get fit. I asked him to train me and after a few months, I started to see results. I could not believe how much physically and mentally stronger I felt. His encouragement,strength and overall desire to see me succeed was tremendous. When I thought I could not do it anymore he helped me pull through and I will be forever grateful. High Definition Training is dedicated in not only achieving ones goals but making the client better. Tone up your abs, ditch the muffin top and thunder thighs, and look and feel at your absolute best! When you get started with High Definition Training, you’ll benefit from a complete and comprehensive approach to your health and fitness. You’ll follow a safe, cutting-edge program, designed to maximize your results, and tailored to your body and your goals. You’ll work directly with highly qualified and experienced fitness coaches, and benefit from a motivating environment where each person works together, and is held accountable. Our sessions are fast and fun, and will help you torch fat, build lean muscle, and look and feel at your best. Angel is amazing, patient and works at your pace. High Definition Training has been the best strength training I’ve experienced, will never step foot in another GYM!! My name is Raquel Miranda. I am 35 years old and a single mom to an amazing 6 year old young man. In the last few years I have had my fair share of ups and downs which were affecting my health in a major way. The last health issue I was faced with was enough to change my entire mindset. In 2011, I decided to take control, at 234 pounds (my heaviest) I knew I couldn’t keep going on this way. Not for me and definitely not for my son (who fought for his life being born at 28 weeks an only weighing 2 pounds). 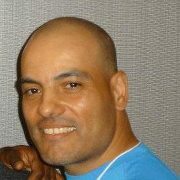 I began to incorporate exercise and decided to join High Definition Training founded by Angel Perez. Angel educated me on proper exercise and nutrition. I even learned about better sleeping patterns. It was not easy….I would get discouraged but I never gave up. Today I am 54 pounds lighter and feeling amazing! I am a work in progress and know for certain that I will continue on this journey. Thanks to High Definition Training’s dedication I will get there. We invite you to come on down and check out our facility before you make any commitment. We take a no sales, no pressure approach with all of our clients. That means that there’s absolutely no risk or obligation on your end to get started. If you enjoy your experience, and you love the results you’re seeing, then stick with it and we’ll get you into the best shape of your life. High Definition Training is unlike anything you’ve experienced before. Everything we do is about maximizing your progress, and helping you quickly succeed on your fitness journey. Personalized programs and assistance, nutritional and lifestyle advice, the latest and best exercises and equipment, and so much more, all in one convenient package. We aren’t merely offering you a place to work out. We’re offering you a bullet-proof blueprint for health and fitness success. When you’re ready to get started and transform your life, sign up for High Definition Training, and we guarantee we’ll help you achieve your goals. PS. You have nothing to lose and everything to gain by signing up for Bronx personal training from High Definition. Try our blueprint for 30 days, and we guarantee you’ll be amazed at the results. We’ll see you at the next session!